The Mpow Flame are super inexpensive, workout-friendly, in-ear wireless headphones that are comfortable to wear and boast water and sweat resistance. Sound quality and battery life aren’t the best, but they make up for it in terms of sheer value. Finding a pair of exercise-friendly, certified waterproof headphones under $50 is not easy, especially if you want them to have good wireless capability. With only a handful of products available, the Mpow Flame stands out for value and quality. 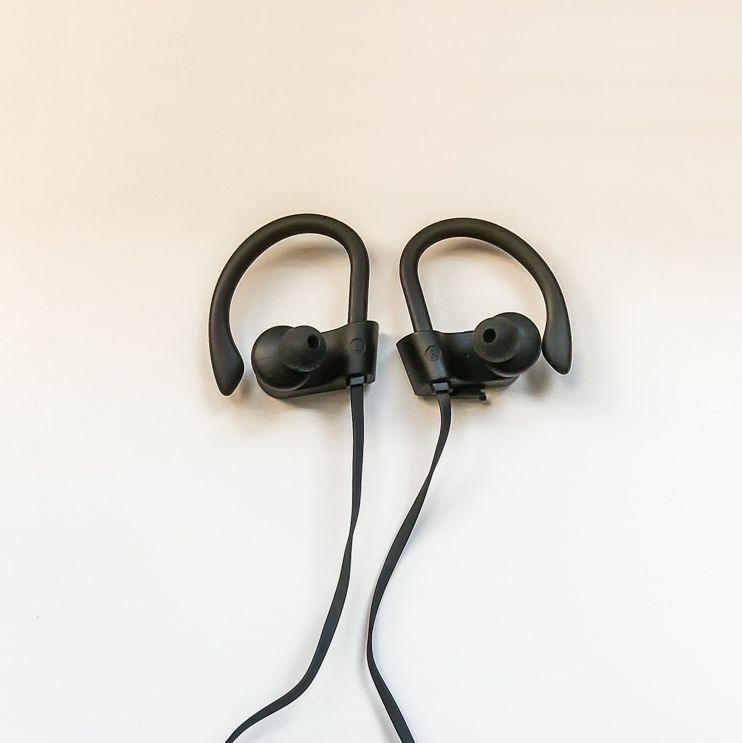 It boasts IPX7 certification allowing it to handle light rain and sweat, comes with several eartips for a comfortable fit, and has decent sound quality for the price. We recently tested the Mpow Flame to evaluate comfort, battery life, sound quality, Bluetooth connection, and waterproofing, while also taking into account the affordable price tag compared with the competition. The headphones are made of lightweight plastic and use silicon earhooks to help secure them on your ears — which is especially helpful while working out. They come in four colors: black, blue, pink, and red, adding a bit of flair to your workout. You can also choose from the three different size rubber eartips or use the included memory foam tips if you want a more reliable audio seal. A flat rubber cable threads the earbuds together allowing you to hang them from your neck when you’re not using them. The combination of the IPX7 water-resistant nano-coating and secure, ergonomic in-ear design makes the Mpow Flame a rare find for this price point. Though Mpow touts these headphones as waterproof and the IPX7 rating theoretically allows for immersion, we don’t recommend keeping them under water for long periods of time. When we left them in a bucket of water for twenty minutes one of the earphones stopped working. So, yes, you can sweat your heart out or go running in the rain, but for headphones this cheap you don’t want to take them in the pool for laps. The headphones come with a round, zip-up, cushioned carrying case with a mesh pocket to hold all the eartips and the USB charging cable. This is a nice extra for such a low price. All three control buttons are located on the right earphone. The Mpow button in the middle allows you to power the headphones on and off as well as pair them with your device. One short press turns it on, holding it down for several seconds puts it in pairing mode, and a longer press turns it off. The arrow buttons on the side of the earphone let you control music and volume, but because they are so tiny, we found it much easier to pull out our phone to make adjustments. Created for athletes, the Mpow Flame were reliably comfortable during all types of workouts and we especially appreciated the shallow, angled design of the earbuds themselves. Instead of being shoved in your ear canal, they sat comfortably right outside it. And though it was nice to have three, different size eartips to choose from, we thought the memory foam tips were the most comfortable — and ended up sealing in noise to produce better bass and noise isolation. The headphones are made of lightweight plastic and use silicone earhooks to help secure them on your ears — which is especially helpful while working out. To keep the headphones from falling out while you exercise, the ergonomically designed loops fit over your ears like and act like an anchor. We used them running on the treadmill, riding a bike and lifting weights. The earloops stayed secure during all our activities and were consistently innocuous. The one thing we found slightly bothersome was the earphone cable. If left alone, it tended to bounce on our neck while we ran. To remedy this, we used the included cord clip for a closer fit around our neck. Despite their budget price, the Mpow Flame enjoy a well-balanced sound profile. You won’t get the clarity and pure quality of more expensive options, but we were impressed with the composed sound and the high-quality audio for making and taking calls. For music, we listened to Anderson Paak’s new single Tints, which provided a perfect mix of hard-hitting vocals in both soul and hip-hop as well as more complicated instrumentals. We were particularly impressed with the deep bass, especially during Kendrick Lamar’s rap solo. Mids were rich and highs lively, though sound tended to get tinny with the volume on higher levels. Of course, one of the selling points of the Mpow Flame is that they’re wireless so you’re not tied to your device. We were able to walk about as far as 32 feet to get different weights at the gym or grab some water, and we were never completely cut off from the audio. That said, the Bluetooth connection did get spotty if the battery was low. Created for athletes, the Mpow Flame were reliably comfortable during all types of workouts and we especially appreciated the shallow, angled design of the earbuds themselves. It took approximately 90 minutes to fully charge the headphones and unlike other comparable wireless products, they only lasted between 7 to 9 hours — about three or four days if we only used them at the gym. There’s no doubt that the Mpow Flame Waterproof Bluetooth Headphones are a bargain. For under $25, you get a set of workout-friendly earbuds which are water resistant and comfortable. The sound quality is more than decent, especially when you use the included memory foam eartips. Other options for wireless headphones with water resistance are limited, with only the WRZ S8 being able to match the Mpow Flame in quality. The Mpow Flame does have a handful of competitors in the same price range, but other lower-priced wireless earbud options like the WRZ S8 do not offer the same level of sound quality nor earhooks that wrap around the ear for better stabilization. The WRZ S8 does benefit from Bluetooth 5.0, giving it a longer, more reliable wireless range, however, this comes at the cost of a lower water resistance rating. For working out and other physically intensive activities, we prefer the Mpow Flame. Take a look at our other picks for the best headphones under $50. Low-cost Bluetooth earbuds with an underwater certification. The combination of the IPX7 water-resistant nano-coating and a secure, ergonomic in-ear design make the Mpow Flame a rare find for this price point. Sound quality isn’t perfect and battery life is lackluster at approximately seven hours, but if all you need is a comfortable pair of wireless earphones to take to the gym, the Mpow Flame is hard to beat in terms of sheer value. Product Dimensions 4.1 x 4.1 x 2.3 in.